The vintage Champs keep coming! Today we have a user submitted amp for your enjoyment. It is a 5F1 model tweed Fender Champ serial number C-03084. 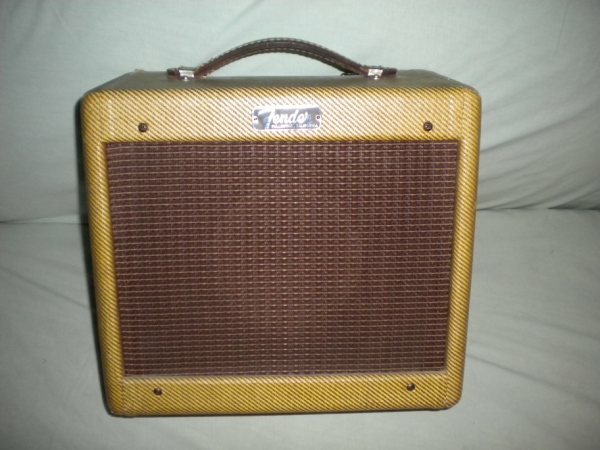 Dating this amp by serial number tells us it was made at the tail end of 1956. It is a little difficult to determine the tube chart date code stamp from the photo, but the current owner tells me it is FK. F means 1956 and K indicates November. The handle looks to be original but the power cord looks replaced, not at all uncommon on these old amps. One of the caps burst and is being replaced. You can’t tell from the photos but the speaker was replaced in the 1970s with one from Radio Shack. Get ready for this. The current owner tells me that they bought this amp from an older gentleman who had it sitting in a corner for years. They paid $200 earlier this week. I’d call that the bargain of the week!